What’s coming up on the Deeper Waters Podcast this Saturday? Let’s talk about it on Deeper Waters. First off, some people have asked about where the podcast is showing up on their ITunes feed. We had to switch carriers due to my last one deciding to drop the show after I disagreed with him on a secondary doctrine. We are now working with the Universal Pentecostal Network and had our first show with them last Saturday, but the process is still having kinks worked out of it and such. Bear with us. I want to get things back up on ITunes as soon as possible. That having been said, let’s discuss what’s going on. The New Atheism has made itself known in the public square for the past decade and longer. The ideas of atheists have really gone public, but unfortunately, the new atheists have put forward a lot of heat but they really haven’t put forward very much light. There have been many books addressing them. One such book is The New Atheism: A Survival Guide. We’ll be meeting with the author, Graham Veale and chatting with him this Saturday from 2-4 PM EST. Graham Veale is co-founder of saintsandsceptics.org, a web ministry for apologetics. A theology graduate of Queen’s University Belfast, he has been teaching religious education for 15 years in Armagh, Northern Ireland. He and his wife, Nicola, are parents of two children. 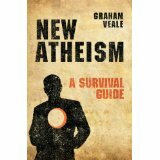 With a particular interests in the evidence for Jesus’ resurrection, and the design and moral arguments for God’s existence, Graham is author of the book New Atheism: A Survival Guide. On the show, we’ll be discussing everything from science and religion to what to do about pasta. Yes. There is actually a topic discussing the Flying Spaghetti Monster. It’s quite amusing to realize that atheism has come to such a level where this kind of argument is put forward and it is supposedly seen as a valid one. Definitely science will be a topic of discussion. Is it true that if you become a scientist, you must reject Christianity? Or on the other hand, if you are a Christian, should you avoid science? It’s my opinion that both of these are highly errant positions and when we present a dichotomy between the two worlds, we do a disservice to both of them. It ends up only feeding the false notion of a warfare going on between science and religion. The new atheism has arrived of course, but what kind of impact will it have? Too many Christians have been unprepared for this, especially those of our youth who are going off to college. We cannot faithfully serve Christ to the fullest without being aware of the strength of the foundation upon which our worldview is built. That’s why I’m thankful to have books out like those of Graham Veale and I look forward to his appearing on my show this Saturday to talk about it and I hope you will be a part of it as well. What do I think of Graham Veale’s book? Let’s talk about it on Deeper Waters. First off, my thanks to Graham Veale for having me sent his latest book and the interest of being on my podcast to talk about it. Having said that, let’s get straight to the book. Graham Veale has added to this and the benefit of his work is it deals with a lot of the latest incarnations that have come about. For instance, there is a chapter dedicated to dealing with the idea of the Flying Spaghetti Monster. It should be an embarrassment to the new atheists that this is really considered an argument. I can’t picture writers like Kai Nielsen, J.L. Mackie, and Antony Flew before becoming a theist using arguments like this. The next chapter is about science and the problem with scientism, the idea that science is the only way to establish what is true and if anything is true about reality, it must be scientifically true. Veale rightly points out that it is not the case that scientific explanations and theistic explanations contradict. They can work together and for the early pioneers of science, they indeed did. From there we go to Dawkins and the problem of a big big brain. He starts off writing about the Courtier’s Reply, which should be a reply that simply shows the massive ignorance of the person giving it. It is a result of what I call “atheistic presuppositionalism.” The idea is that we know these other stories are nonsense, such as leprechauns and fairies, and God is in the same category. But that’s the very question under discussion! Is God nonsense like the others? You don’t demonstrate that by just asserting it. You demonstrate it by interacting with the best your opposition has to offer. From there, we move on to design. Now I’m not going to say anything about the design argument insofar as it is the design argument. I don’t hold to it in the ID sense, but I do think it’s important to point out Dawkins’s hilarious claim that if this universe is designed, then its designer must be even more amazing and thus, He must be designed. This is the point of the big big brain in the title. Dawkins treats God as if He was a physical being with a physical brain and thus having a designer. This is certainly not the God of Scripture, nor of Aquinas, nor of most any Christian theologian throughout the centuries but hey, evidence. Who needs it? If this is what you think your opponents believe in, well you don’t need to show that they do by actually researching them. Just make assertions! The chapter after this deals with the moral argument mainly as a way that we know right from wrong. While I do not think the argument from a personal experience that’s also presented is the best argument, for some people, it does count as data. I could say it is certainly a part of our experience that needs to be explained. We move on then to questions of miracles and who Jesus was in the eyes of His contemporaries. This is the main chapter that focuses on the resurrection which is absolutely essential. I do think Veale has done some excellent interaction with some of the latest scholarship and that includes the scholarship that is not friendly to his position. He interacts with the ideas of Second Temple Judaism using sources like Hurtado and Bauckham as well. Next we move on with a section on the Insider Test for Faith. This is certainly a response as is said to an atheist who would love to be mentioned. The last chapter is about how the Gospel is for all people. This also deals with the problem of evil and rightly points out that the solution to the problem of evil is the Gospel. Now some might be hearing that and thinking that it means accepting Jesus as your Lord and Savior answers why God allows evil. That’s not what’s being said. The answer to evil is that God is reclaiming this world and reshaping it in Christ and that includes evil. I don’t agree with all Veale says in this book (I don’t think Jesus was honorably buried for instance) but those points of disagreement are mainly on secondary matters. I do find the style to be engaging. If you have read much on the new atheism on both sides, you might not find much new material here, but if you’re looking for an engaging one that deals with style as well as “arguments”, you should enjoy this one.